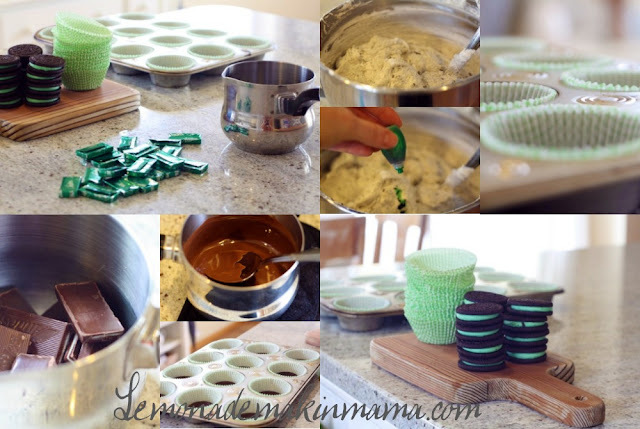 Lemonade Makin' Mama: Chocolate Mint Oreo Cupcakes. Hey you know how I just posted that I liked feeding people? Well, I recently had a little dinner party (that I'll be posting on soon) and made these cupcakes. They are an updated version of my previous Oreo cupcakes... And these are about a million times better. Which is funny, since the other ones were already amazing. Once again, get a package of Oreos. I'm pretty sure most good things in life might begin with those words. I bought mint Oreos for this version. And once again, I placed one into the bottom of each cupcake liner. I used the same icing recipe, (below) but I added some of the crushed mint Oreos instead of regular ones, and a few drops of green food coloring. I topped each cupcake with a Godiva mint truffle, because I love my friends, and that's who these were for. I found these adorable green and white gingham cupcake liners (and most other cupcake liners I use) from Michaels. You can also visit www.bakeitpretty.com for more amazing choices. *Beat 4 1/2 sticks room-temperature butter and 1 1/2 cups powdered sugar until pale and fluffy. Gradually add an additional 5 1/4 cups powdered sugar. Add 1 1/2 tbsp milk and 1 tsp vanilla extract. Beat until pale and fluffy. Now stir in 2 cups crushed Mint Oreo cookies. Store at room temperature until ready to use. Those look yummy. I can't wait to try them, at my next party of course, because I absolutely can't have those laying around my house. Thanks for sharing. Would you mind sharing your banana bread/with chocolate chips recipe you posted about in a previous post. 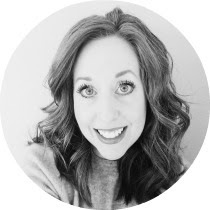 I think I stumbled upon something of your's on pinterest, and I have been hooked ever since...I just wanted you to know how much I look forward to your blog posts and how they inspire me! Thanks for sharing! I am so making these. Did you use a vanilla cake mix? Seattle Gal, I used chocolate cake mix for this batch and vanilla for the original version. Deborah, I just used the Better Homes and Gardens banana bread recipe, doubled it for two pans, and split a cup of dark chocolate chips between the two- I just sprinkled them right onto the top of the batter before baking. You are such a good mom, wife, friend, not to mentioned blessed with many gifts in many areas. Thanks for sharing! my husband said you had him at mint oreo... ;) Too bad my daughter has a milk protein allergy (we try not to eat what she can't) or we would be eating these every weekend. I was just going to ask you where you find your cute cupcake liners, thanks for sharing! I'm practicing my cupcake frosting skills this week, I can only dream to make them look as fluffy and fancy as yours! Yes, please! These are going in the 'must bake' file! They look awesome!! OH MY GOODNESS. And I'm trying to start a diet today. holy cow friend WHY can't you live across the street!!!??? geesh. God knew i'd weigh 300 pounds if you did;) okay where's the mountain pics?? Did I tell you I'm not eating sugar?? That would make you the devil. lol Just kidding... I cannot WAIT to try these (when I'm eating sugar again.) Mint is my absolute FAVORITE! Wow - those are just beautiful! I had to come back and comment on these because I made them yesterday. Learned that if you put them in the middle they come out much better and you lose the risk of burning the cookies on the bottom. We did half in middle and half on bottom. Hubs LOVES them and will be making them again! Oh and try them with the fudge mint oreos inside.. YUMMY!